Enjoy classic Hollywood fun at the Hollywood Roosevelt, which boasts vintage bowling lanes, ping pong tables, the David Hockney pool, and a prime location along Hollywood Boulevard to explore shopping and attractions. 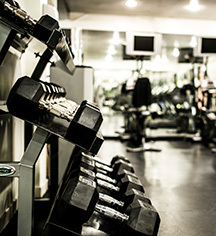 The hotel offers a 24-hour fitness center that features state-of-the-art cardio-vascular equipment and free weights for guests to stay fit during their stay in L.A. 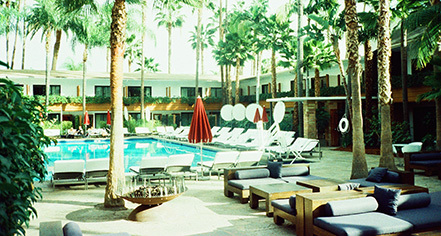 The celebrated pool at the Hollywood Roosevelt has played host to notable stars such as Marilyn Monroe, Charlie Chaplin, and Clark Gable. With a few contemporary upgrades, the David Hockney pool features flourished palm trees, plush sun loungers, and Tropicana servers delivering everything from burgers to martinis. As the sun sets and the Tropicana Bar sign glows more vibrant, the poolside turns into one of the most coveted hotspots in Los Angeles. The trees are lit up with sparkling lights, the pool is masked with translucent flooring, and the guests begin to stream out of the private bungalows surrounding the poolside, seeking refuge in the plush lounge area. The pool is open from 8:00 a.m. until 12:00 a.m., Sunday to Thursday; and until 2:00 a.m., Friday and Saturday.